Jaragua (Hyparrhenia rufa (Nees) Stapf) is a robust, tall (60-240 cm) and erect perennial grass. It is generally densely tufted and has short rhizomes (FAO, 2011; Quattrocchi, 2006). The culms are coarse, 2-6 mm in diameter (Clayton et al., 2006). The leaves are 30-60 cm long and 2-8 mm wide (Clayton et al., 2006). The inflorescence is a narrow and loose panicle, 5-80 cm long, composed of terminal and axillary racemes (Clayton et al., 2006). The racemes are subtended by a large spathe and bear shortly hairy sessile (bisexual) and pedicelled (male or sterile) spikelets (Quattrocchi, 2006; Clayton et al., 2006). Jaragua is commonly used as native pasture, hay or silage in East Africa and Latin America for beef cattle production (Ecocrop, 2011; FAO, 2011). It is also a useful thatching grass and general purpose straw, and can be used to make pulp for paper (Quattrocchi, 2006). Jaragua grass is a fast-growing grass that grows from spring to autumn (Ecocrop, 2011). Jaragua is thought to be native of Africa and is now widely naturalized in most tropical regions (Africa, Asia, North and South Americas, Pacific region). It is cultivated in Africa, in the United States, in the Caribbean Islands and in China (USDA, 2011). Jaragua is mainly found in seasonally flooded areas, open woodlands, disturbed areas, cultivated fields and under trees or on termite mounds. It is found from sea level up to an altitude of 2000 m in Colombia (Ecocrop, 2011). Hyparrhenia rufa grows best in areas where annual rainfall ranges from 600 to 1400 mm (FAO, 2011). It can withstand waterlogging and temporary flooding (Quattrocchi, 2006). Jaragua is also tolerant of dry conditions: it withstands a dry season of six months in the Llanos of Colombia and in Bolivia. Jaragua grass grows best on black clay soils and latosols. It responds positively to moderate applications of N and P fertilizer and tends to be sensitive to aluminium toxicity. It cannot withstand frost but can regrow after burning (FAO, 2011). Jaragua grass can make good fodder: it can be either grazed or cut for hay or silage. It can be sown alone or in mixtures with other grasses or legumes with which it does well. Jaragua seeds can be broadcast or sown in 25-40 cm rows (FAO, 2011; Ecocrop, 2011). Jaragua grass establishes rather slowly and it should not be grazed during the first 6 months after sowing in a clean, prepared (including application of fertilizer) seedbed. If jaragua is broadcast on a burnt meadow without soil preparation, stands take about two years to establish (Göhl, 1982). Dry matter yields can range between 4.5 t/ha and 19 t/ha. 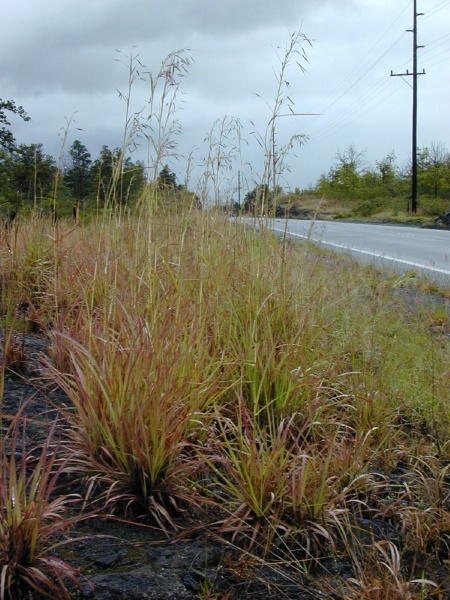 Once established, jaragua grass should be rotationally and heavily grazed, short cut (height should not be higher than 15 cm) or burnt in order to prevent flowering or tussocks development (FAO, 2011). Continuous grazing is not recommended as it hinders jaragua growth and makes it disappear (Quattrocchi, 2006). Jaragua grass can also be used as hay or silage and should be cut before flowering at a height of 60-70 cm (FAO, 2011; Sarwatt et al., 1989). Though fermentation occurs slowly, jaragua silage quality is fairly good (FAO, 2011). 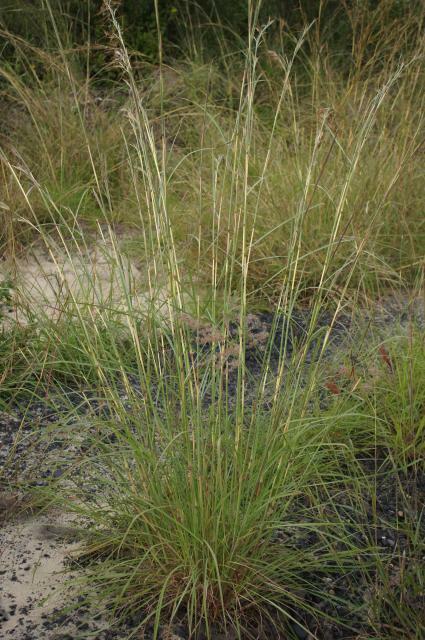 Jaragua grass competes strongly with weeds and can smother them (FAO, 2011). The creation of a jaragua pasture may alter soil water balance in the tropical, subtropical and warm temperate areas of the Americas. When jaragua grass escapes from cultivated pastures, it is very competitive and can be a threat to the biological diversity in disturbed areas. 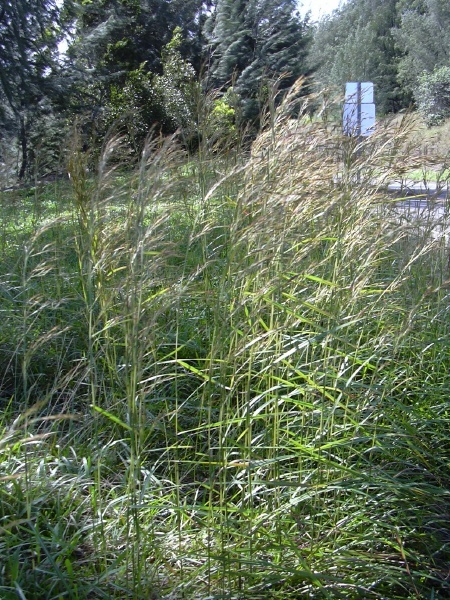 In Australia, jaragua grass, like molasses grass and para grass, is considered to be an invader (Williams et al., 2000). Jaragua grass has a low nutritive value because of its low protein content and high fibre content (NDF and ADF). In Costa Rica, the protein content declined from 6.5 to 1.5% DM during the dry season (Ibrahim et al., 2001). Jaragua grass was reported to contain 0.85% oxalic acid but no toxicity was found (Ndyanabo, 1974 cited by FAO, 2011). Jaragua grass is either grazed, offered as fresh cut forage or made into hay. One of its most frequent uses is as a pasture in extensive beef production systems. Because of its generally poor nutritive value, jaragua grass must be supplemented with a nitrogen source (legume tree leaves, legume grasses or a nitrogen-rich by-product) and an energy source (molasses, citrus pulp, cereal bran). With adequate supplementation, jaragua grass can support moderate animal performance, and even high performance when the pasture is well managed. When harvested at the end of flowering stage or later, jaragua hay had a low nutritive value with a DM digestibility of 51% and a low DM intake of 31.3 g/kg W0.75 in goats. Its nutritive value increased with the addition of ammonia or urea (Oliveira et al., 1998b; Reis et al., 2001). These treatments increased the crude protein content from 3.7 to 10.4% DM and the DM intake of goats to 44.3 g/kg W0.75. However, ammonia treatment did not increase the in vivo DM or OM digestibility (Oliveira et al., 1998b), or NDF and ADF digestibility (Oliveira et al., 1998a). Jaragua grass can be ensiled but in sheep the DM digestibility (48.5%) and the DM intake (55.9 g/kg W0.75) remained low due to the low nutritive value of the original material (Sarwatt et al., 1989). In Brazil, the percentage of jaragua grass in the botanical composition of natural tropical pastures varies according to the season. It increases from spring (4%) to autumn (14%) and then decreases (8%) in winter. Simultaneously, jaragua grass represents 2.4% of the intake in spring, 30% in autumn and 0.3% in winter (Diogo et al., 1995; Sanchez et al., 1993). Young steers grazing natural pasture during the rainy and the dry season select more jaragua grass in the rainy season than in the dry season (Nascimento Jr. et al., 1995). Even when jaragua grass is poorly represented in a tropical pasture (less than 2%), it is well consumed by the animals and may represent 30% of the intake at certain periods (Rodriguez et al., 1979). When breeding beef cows, of various breeds, were managed on poor jaragua pasture, the age at first calving and the calving interval were high with 1472 and 558 days respectively. Moreover, the weaning weight (at 240 days) and yearling weight were low at 179 kg and 220 kg respectively. These results are mainly attributed to the poor quality and low DM availability of the pasture, which limit the attainment of the genetic potential of the various breeds (Osorio-Arce et al., 2010a; Osorio-Arce et al., 2010b). Poor quality tropical pasture containing jaragua grass can be improved either by introducing legumes (Fabacaea) and good quality grasses or by supplementing animals with nitrogen and energy sources. Results obtained in several Latin American countries are summarized in the table below. Supplementing poor quality jaragua grass pasture (protein 2.5-5.6% DM; 32-36% in vitro DM digestibility) grazed during the dry season by heifers (250-350 kg) with legume tree leaves (Cratylia argentea) increased the DM intake from about 1.7 to 2.6 kg DM/100 kg W, intake being stimulated by the increase in nitrogen intake from the leaves. Adding molasses to the leaves increased the leaf intake from 0.33 kg DM/100 kg LW without molasses to 0.42 kg DM/100 kg LW with molasses (Ibrahim et al., 2001). Supplementing poor quality jaragua hay with 1.6 kg DM legume tree leaves (Erythrina poeppigiana and Gliricidia sepium) as a nitrogen source and 1.7 kg molasses + 1.9 kg rice bran as energy sources supported a moderate daily milk yield of 7.4 kg/d in dairy cows (Camero Rey, 1993). Fresh jaragua grass (protein 5.3% DM) offered alone to young weaned rams resulted in a DM intake of 63.5 g/kg W0.75. Jaragua grass fed alone for 8 weeks could not maintain the body weight of the lambs (-2.4 g/d). When fresh jaragua grass was supplemented with 10 to 40% leucaena leaves, total DM intake increased up to 69-72 g/kg W0.75 with 30% leucaena and to 75.5 g/kg W0.75 with 40% leucaena. When the inclusion rate of leucaena increased from 10 to 40%, daily weight gain increased from 15.2 to 49.5 g/d (Balogun et al., 1995). Jaragua hay (protein 4.8% DM) offered alone to adult rams resulted in a DM intake of 40.2 g/kg W0.75 with a low DM digestibility of 37.5% (Escuder et al., 1981). Jaragua hay (protein 6.6% DM) offered ad libitum to yearling male goats (LW 20-23 kg) resulted in a DM intake of 56.3-57.6 g/kg W0.75 (Melaku et al., 2008; Betsha et al., 2009), although with a small live weight loss (-30.2 g/d) (Melaku et al., 2008). When supplemented with 200 to 400g/d of groundnut cake and wheat bran, the DM intake of jaragua hay decreased to 41-43 g/kg W0.75 (Melaku et al., 2008; Betsha et al., 2009). The whole diet DM digestibility increased from 57% (no supplementation) to 61 and 69% (200 or 400 g/d supplementation respectively) (Betsha et al., 2009). The supplementation with 200 to 400g/d of groundnut cake and wheat bran supported an average daily weight gain of 36 and 44.7 g/d respectively (Melaku et al., 2008). No information on jaragua grass utilization in rabbit feeding is available from literature. Nevertheless, because it could be used without any problem in ruminant feeding, and in relation with its very low protein and high fibre contents, fresh jaragua grass or jaragua hay may be considered as a fibre source in rabbit feeding, with a value comparable to wheat or barley straw on a dry matter basis. However direct experiment with rabbits would be advisable before being extensively used (Lebas, personal communication 2012).